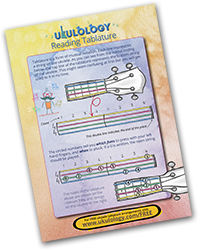 Ukulele tablature (tab) is a very easy to understand and useful way of notating ukulele music. It allows you to read and notate melodies without being able to read music, and it shows you exactly where to play it on your ukulele fretboard. 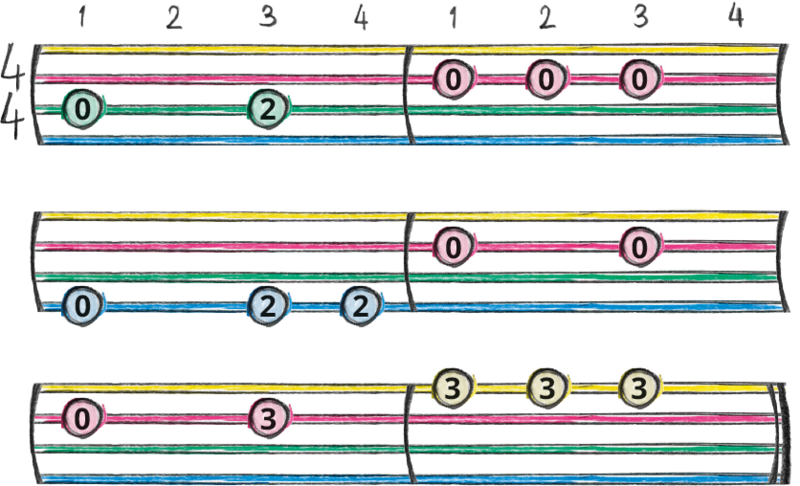 The four horizontal lines represent the strings of your uke. As you can see from the colour-coding, it might seem upside down at first, but think of it as being written from your point of view! Slide your uke down from the playing position so it is flat your lap and look down at it. 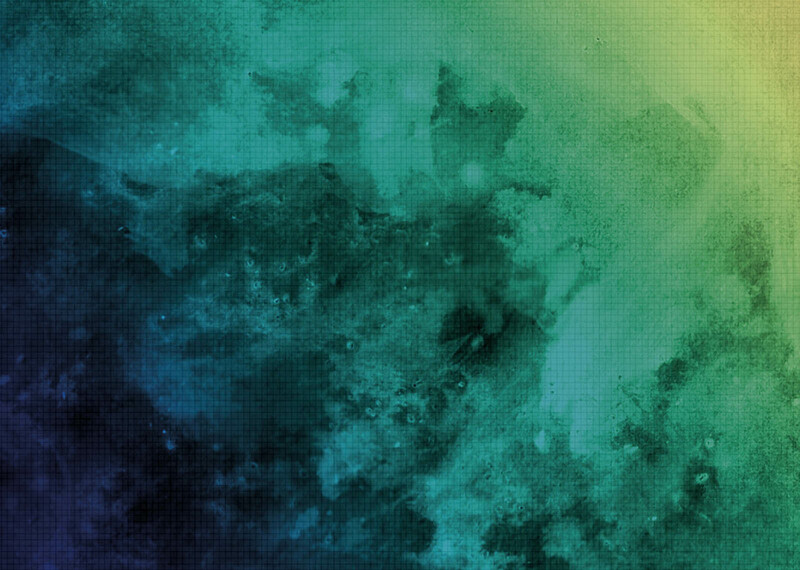 Now it looks the same way up! The count along the top helps you play the notes on the correct beat. Count a regular 1, 2, 3, 4 as you tap your foot. All that we do now to show which notes to play, is write numbers on the strings. The number indicates which fret to hold that string down at. A zero means that string is played open (with no left hand fingers holding it down). We read from left to right, and try and pluck the string in time with the count. Remember, your right hand shouldn’t be strumming all the strings, just plucking the string indicated in the ukulele tab (try using a thumb rest stroke). Here’s a little exercise for you to try. So you don’t end up sliding one finger around to play all the notes, try and get used to using your first finger to play notes at the first fret, your second finger for the second fret, etc. Which is just another way of showing the familiar C chord! Here’s a little exercise to help you get used to playing two notes at a time. Ukulele tab is a great way of learning more songs, melodies in particular. It’s actually quite logical, and not as scary as it first seems! 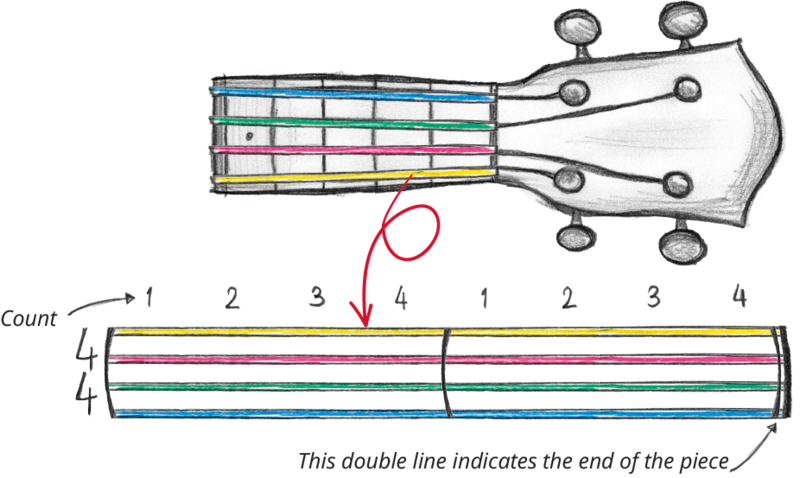 Get used to using your 1st finger for fret 1, 2nd for fret 2, etc. It will be hard using your 3rd and 4th fingers to begin with, but it will really help you when you play more complicated tunes later. Don’t be frightened of ukulele tablature. It might look like traditional written music, but it is much easier to learn to read. 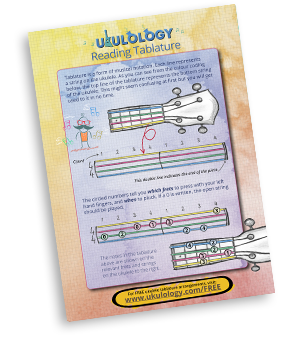 Simply fill in the form to receive our Reading Tablature and Extra Pieces PDFs as well as chord charts, strumming patterns, songs, backing tracks and more! 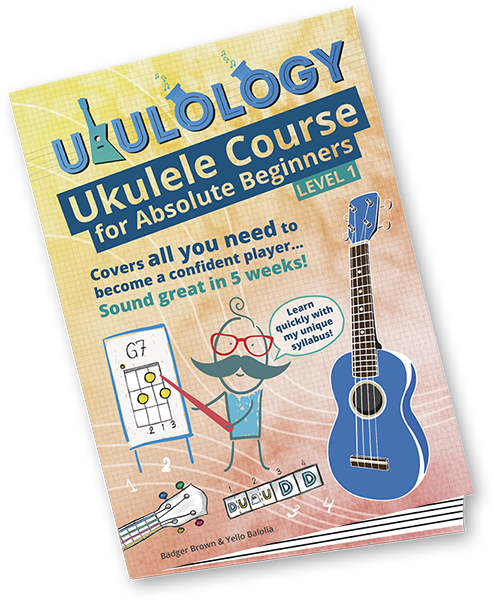 FREE guide to reading Ukulele Tab!